With the new "Technogym Live" digital platform coming soon, what better way to launch it than with a new bike - catchily named the Technogym Bike. They are sure to add a new moniker sometime soon but, in the meantime, what do we know about this latest offering from the uber-stylish Italian fitness equipment brand? March 2019 started with an exclusive London launch event where it was rumoured the new Technogym bike was to make it's appearance. Spot on. What Technogym also went on to show was their roadmap for fitness content and interaction with their users. The new Technogym LIVE digital platform will offer their end-users (as they call them) fitness trainers, videso and guides whether you're at home, in the gym or even in the office gym. Eventually this will be available on their smart bikes, rowers and treadmills. The "Live" platform is also designed with gym, studio and hotel operators in mind as it allows them to stream their classes to their members in the gym and in their homes. This gives Technogym access to potential users 24/7. Why Focus on Fitness Content? Technogym want their fitness content (videos, guides, tips) to link seamlessly with both their current fitness equipment and with a new range of equipment they are working on right now. That manes you will get a synergy between style, technology and information - as a way of attracting, retaining and inspiring consumers of the technogym brand. 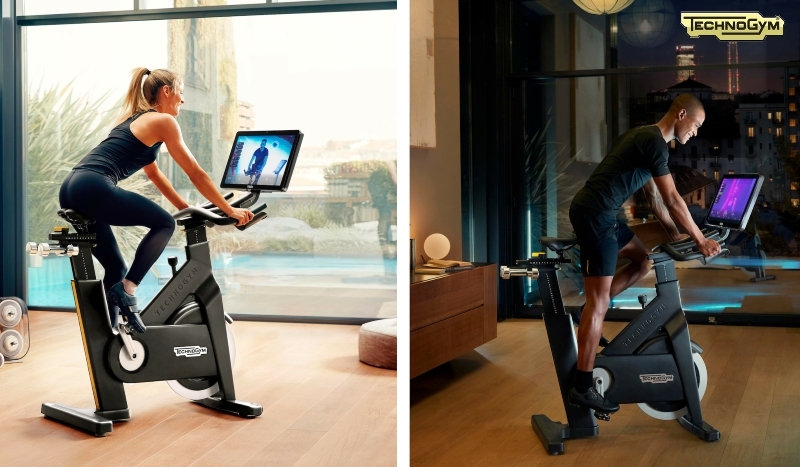 As the first product to be released on the digital Live program, the Technogym Bike is actually a hybrid of the current Group Cycle, with the digital platform to put classes and groups right in front of the user, at home or in the gym. An adapted, hybrid group cycle, it's a commercial grade indoor cycle that has suiccessfully been used across the world for indoor cycling classes and professional riders. With it's indoors / outdoors experience, the Poly-V belt with kevlar cords, the near perfect fit and posture settings and magnetic resistance system, it is a market leading indoor cycle that allows you to work as hard as you want in any type of riding class. Adding the new Live experience takes this to a whole new level. The Technogym Bike's display is based on the popular Unity 3 platform. This ensures a simple and clean user interface and controls and allows for the online and offline delivery of content right to your fingertips. Technogym have developed the 'open platform' to enable users to access classes wherever they want. For operators, this allows them to connect with their members and users, streaming relevant content and classes in to homes, gyms and even workplaces. All that's needed is an internet connection and the Technogym Live platform. But allowing users to connect to a live class is just one of it's great features. Having the ability to connect and partake in an earlier class you missed is just genius. With a library of previous classes and videos, you can search for a workout that suits you whether that's due to the intensity, the type or even the length of the workout you want.